The Heat has lost two consecutive games; the latter being a 20-point drumming by the Roseless Bulls on TNT. They’ve been without Dwyane Wade, but the reports on Twitter indicate he’s shooting around and might play tonight. That’s not good news for a Wolves team trying to get back to .500 without its own best player. In any event, it will be a fun game to watch because… well, LeBron James. But we’re less interested in the MVP or his All-Star teammates than we are a former Timberwolf returning to Target Center with career-best numbers and a renewed sense of basketball purpose. That’s right, we’re talking about the one and only Supercool Mike Beasley, a longtime PDW favorite. Beasley is only playing 17.6 minutes per game, but that’s 17.6 more than just about anybody expected after his famous regression from prized draft prospect and promising young talent to inefficient chucker who didn’t play defense but did get himself into off-court troubles. Beas isn’t just playing in Erik Spoelstra’s rotation. He’s playing REALLY well. His 23.2 points per 36 minutes is a career high. So is his 54.6 field goal percentage, which is downright ridiculous for a combo forward like himself. Beas has always had obvious talent and it appears he’s finally begun to tap into it in a way that helps an NBA team win games. The Heat are playing 12.9 points better than opponents, per 100 possessions, with Beasley on the floor. Suffice it to say this is a sharp change from his recent seasons in Phoenix and Minnesota. It’s also way better than LeBron and the other Heat starters, which is probably unsustainable but nevertheless a reflection of how well he’s been playing. For more on Supercool Mike’s improvement, check out Tom Haberstroh’s espn.com feature (Insider, sorry). We thought it appropriate to preview tonight’s matchup by recalling our favorite Beasley stories. Do you remember the game against the Knicks when Kevin Love scored 31 points and grabbed 31 rebounds? What you might not remember is that in the same game, Mike Beasley dropped 35 points and 4 assists. The performance inspired a John Hollinger feature story about the Wolves promising young forwards. He referred to Beas as “Carmelo Lite — a high-scoring 3 who can move up to the 4 with middling percentages and low assist rates.” Setting aside the backhanded nature of that statement (I don’t think John realized how cool of a player he was describing, but whatever) it evidenced a rare point of optimism during the Rambis years. That was a fun game and Beasley was a huge reason why. Mike Beas was the quintessential one-and-done, breezing past Big 12 competition as a freshman at Kansas State. He averaged over 26 points and 12 rebounds, shooting over 53 percent from the field and almost 38 percent from downtown. Beasley was so good at KSU that Stats Only draft prognosticators rated him higher than Derrick Rose. He really was that great as a college player. When a 21-year old Supercool Beas is the dominant personality — on the court and off — of your NBA basketball team, be prepared to suffer through some losing. But that doesn’t mean it won’t be a fun ride. At his first Media Day, Beasley stole the show — or “created” the show, I guess. THE B-EASY SHOW. 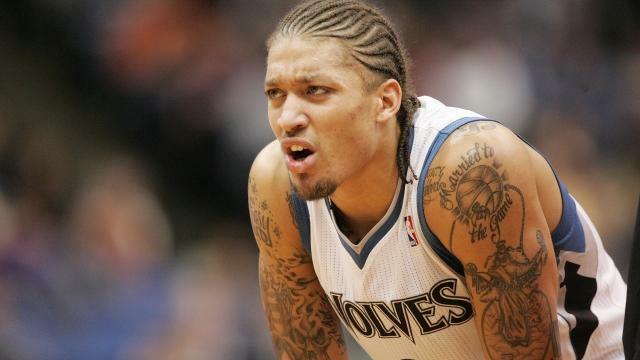 Hey, Wolves fans, Shabazz Muhammad isn’t the first player who’s donned a Wolves uni AND gotten his self in hot water at the NBA’s Rookie Transition Program: Mike Beasley did it too. And, as you might expect, Beasley’s story has a lot more color than Bazz’s run-of-the-mill groupie slip-up. Sure enough, a day or two later, the story broke that Beasley had been fined $50,000–more than double the amount Arthur and Chalmers were fined–and that he had been right at the center of the action. (Eds. Note: Beas was probably an old pro at that game, and he showed it that night, by allegedly acting as the FLUSHER who destroyed the evidence and almost getting away with it.) It wasn’t the best start to a career a player could have, but hey, at least no one can accuse Beas of trying to be something he’s not. OBVIOUS STATEMENT ALERT: Beasley and Rick Adelman did not hit it off. When Beas was playing hard (and yes, he did for a while) his shot went cold on him. Then he got hurt, then he lost his spot in the lineup, then he started sulking and jacking up dumb shots. (Which he often made!) All in all, it was a bad season for Mike Beasley. But that doesn’t mean he didn’t have any hot nights. The best came at Staples Center against Chris Paul and Blake Griffin when Beasley and Derrick Williams each scored 27 points off the bench. (!) They shot a combined 20 for 25 from the field and 7 for 7 from downtown. It was one of those small sample size, regular-season flukes where you just hope you happen to be watching when it goes down. #LeaguePassAlert, and all that. Holy cow was that a ridiculous shooting performance. If he was watching, I bet Steph Curry was even impressed. The Wolves beat the Clippers that night even though Blake Griffin dominated Love, who eventually left the game with a minor injury that allowed Beas and Thrill to go to work. I’ve told this story before. Version 1 here. Version 2 here. We all know that it didn’t work out for Mike Beas in ‘Sota. But that doesn’t mean it wasn’t a fun experiment. You could almost tell, just by looking at the pictures taken of Beasley at various points of the presser introducing him as the Wolves’ newest player–what a roller-coaster ride his time here was going to be. It kind of resembles the cycle of life…or something. David Kahn was the GM who rolled the dice on Beasley and brought him to Minnesota. Whatever his faults as a talent evaluator, one thing David Kahn never failed at was somehow managing to say just the wrong thing in the most articulate way possible. Michael Beasley had clearly never been pushed on the basketball court by someone who compelled him to make his team better–until this season. This postgame interview from November 12 reveals a lot about how good it is for Beasley to be in a winning culture like Miami’s and to have a mentor who happens to be the best basketball player who ever lived. Hearing Beasley admit that he’s watching LeBron and trying to learn from him is probably the most mature thing I’ve ever heard him say. (Even if he does close the interview by saying, “My head’s shaped funny.”). In all seriousness, whatever his flaws, we’re both huge fans of Mike Beasley not only for his personality quirks but also because –when he’s engaged–he’s such a dynamic offensive player and so fun to watch. Here’s hoping for his continued success in Miami and wherever else his career takes him. UPDATE (2:25 CST): We made one egregious omission from Beasley’s Best up above: THE ESTATE SALE (!) A Wolf Among Wolves blogger Zach Harper was there that day and got the goods. (Literally, he walked away with a framed Yale poster, straight outta Chez Beas). We’re not pretending we’re not jealous. Meanwhile, here’s some Beas video to groove to before the tilt. Enjoy the game. Great story–and one I hadn’t heard. Leave it to Beas-er. Is there a video of the Odom play anywhere online? I looked for a couple weeks after the game but never found it (surprisingly, Beas got away with something haha). It was that game against Dallas where Rubio put it between Dirk’s legs to Tolliver, pretty early in his rookie year I think. If the play with Beas wouldn’t have happened right in front of me, I don’t know if I would’ve noticed. Would probably have to watch the entire game tape to find it. Not as good as the NSync one, but still classic Beasley.